How can your relationship help you to be happy? Great question! The perfect question, as a matter of fact. And the fact is that the best thing you can do for your relationship is to focus on what you love and appreciate about yourself and the other person. The big mistake we make is thinking we'll be happy if we can just get that other person to change. That's a totally flawed strategy. They may or may not change...and probably won't as long as you're focused on what you don't like about them. You start your relationships with good intentions. It's your nature to be that way, as a human being. At this stage, you see the best in the other person, and you tend to be at your best also. This is true in a new romance, new friendship, or with a new parent child relationship. You're just getting acquainted, so you want only the best. Sooner or later, irritations start and buttons get pushed. This always happens, because we are all so very unique as individuals and in many ways so different from each other. If you don't know about your buttons and you're driven by your emotions, you might decide that some of these issues are deal breakers. Then you start to change or fix them. You might do this by trying to please them, and thereby diminish yourself, or you might try to change them by criticizing and complaining. This can be conscious or subconscious on your part. Either way, you don't realize that your efforts to please or your judgement and criticism are actually making things worse instead of better. Things only get better when you return to love. Now you start to remember the beginning, and why you loved this person in the first place. 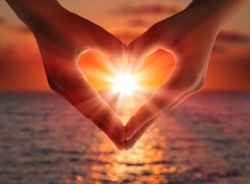 You decide that you're only gong to focus on their positive aspects, which not only feels better to them, it also helps you to connect with your good heart and loving nature. This is probably familiar to you. Hopefully this relationship help will take you further and further into the not-so-familiar territory of happy relationships. And I think you can see here how this approach can help you to be more of who and how you want to be. Tell Your Story Or Ask Your Question Here! Why Can't I Get Them To Change? That is such an important question. It seems so clear that if she would just...or if he wasn't so...or if she was more like...or if he would just stop...you know the story. You are independent by nature, and you only want to change if it's your own idea. This is a good thing, and something that can serve you well if you understand and work with it. When you feel judged or criticized, you automatically go into a defensive mode--we all do. This stops your growth and self improvement temporarily, while you keep your focus on that person who is judging you. You will either shut down or react at this point, which of course sets up the conflict and distance you that you really don't want. This is when you start seeking relationship help. When someone is trying to get you to change, you also feel like they do not love you as you are, and this hurts. So, you're not motivated to change for someone who is hurting you. The bottom line here is, it just doesn't work to try to change anyone. But if you follow the steps below, you can still get the relationship help and happiness you're looking for. Here's a fantastic video featuring Dale Williams, Executive Coach, who explains how focusing on the positives in relationships works so much better. He also talks about Positive Psychology, an important new field of study that focuses on strengths and assets in individuals instead of pathology. 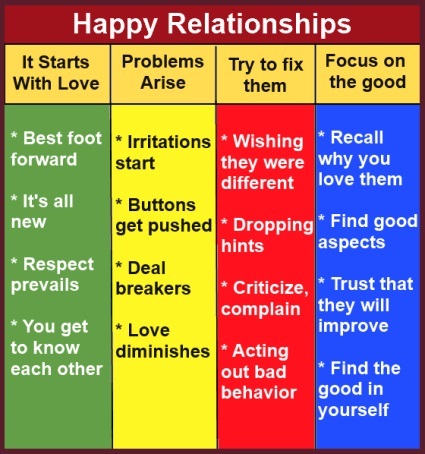 What Are The Steps To Happy Relationship Help? Creating a happy relationship is one of the greatest challenges we face in life...and therefore it contains some of the greatest rewards. The type of relationship help we're offering here is actually about moving from conditional to unconditional love, which will bring you benefits beyond measure. Look for and focus on the best of the other person. Think about and journal about their most positive aspects until that predominates in your mind every time you think of them. Trust them to rise to their own highest and best self, in their own way and in their own time. They will feel your trust, and they will feel and act more trustworthy as a result. Be aware of your own "buttons" and background issues. Work consistently on understanding yourself and moving past old patterns that get in your way. Learn to love and approve of yourself as you are, while constantly growing into the person you want to be. Watch for and focus on every effort the other makes to improve. However small, be pleased with any progress you see as they become the wonderful person you know they truly are inside. Hold a vision of their highest and best in your mind at all times. Express your appreciation on a regular ongoing basis. Be a Goodfinder in your relationship and in yourself. Express your gratitude, appreciation and optimism on an ongoing basis, through journaling and face to face. These steps are especially important in creating and maintaining a happy, fulfilling marriage. A truly fulfilling and happy marriage is within your reach. I know it may not be as simple as this sounds, and there may be other steps you need to take. But do not underestimate the power of these tools for the relationship help you need. Your mental focus is actually a creative mechanism, and when you make up your mind to make it positive and uplifting, you will actually create more goodness, joy and well being in your relationships. This page is focused on solutions, not problems. If you need some problem solving before you can take some of these steps to happy relationships, that's OK. I can help you with more indepth relationship help and you can learn how to solve marital problems here. The important thing is that you make up your mind that you will improve your situation and continue your movement toward creating happy relationships, no matter what. "When you feel loved by someone you love, you are motivated to improve yourself to keep the love flowing." Positive Marriage Expectations -- Make all of your conscious and subconscious expectations work for you instead of against you, with this powerful information and audio program. Happy Parent Child Relationship -- Happy parents are good at happy parenting, and that creates happy children and fantastic, fun and fulfilling parent child relationships. Find all the steps you need to take here. Positive Parenting -- A positive focus is key to successful parenting. Paying attention to all of the good efforts your child is making will build their self worth and help them to rise to their highest levels of development. Parenting Help -- Help for and by parents, on this page that allows you to ask questions, respond to others' questions, and offer advice from your experience. The Definition Of Trust -- This article will help you understand how to establish trust that really works for you. Learn about the Circle Of Trust, and how it can help you have peace of mind and confidence. Your Happy Animal Story -- Read some great stories, and tell your own. Animals touch all of our lives, and these stories will warm your heart, make you laugh, and help you relax and breathe. Courageous People -- You are a courageous person, simply for having survived what you've been through. Learn about the ways in which you are courageous and how your courage can help you. Have A Great Story About Love? Do you have a great story about how love has touched your life? Please share it! If selected, your story will appear on a Web page that you can share with friends and family!